March 29, 2018 – Finding a place to live in one of Canada’s largest cities is a notoriously painful exercise. And it’s one often made even more painful for those looking for a new home with the pets. Across the country, landlords who don’t want animals in their buildings can – and do – refuse to rent to pet-owners, something activists have been pushing to change. A newly released analysis of polling data from the Angus Reid Institute finds a majority of Canadians inclined to disagree with those petitioning for increased rights for pet-owners, though opinion on this varies depending on whether one is a homeowner or a tenant. 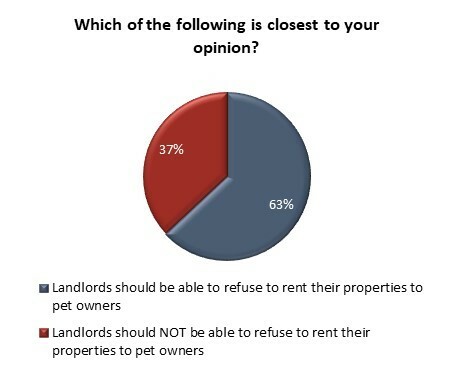 Overall, more than six-in-ten Canadians (63%) say landlords should be able to refuse to rent their properties to pet owners, but the percentage holding this view rises to seven-in-ten among homeowners (70%), and falls to roughly half (50%) among renters.